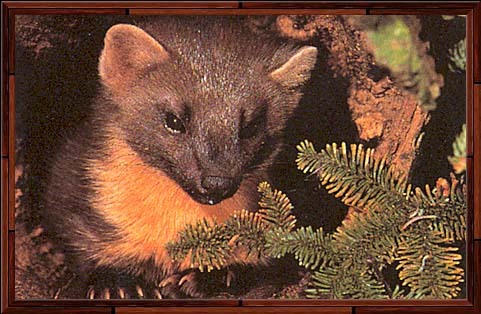 The pine marten was once quite common throughout Britain. Now it is uncommon and found mainly in remote forests or sometimes on rocky moorland where it spends quite a lot of time on the ground looking for food in forest rides and grassy areas. Prime habitats for pine martens seem to be well wooded areas, with high densities of voles that are their principal prey. Martens have a very varied diet, which changes with the seasonal availability of different foods. Small rodents are a very important food, but birds, beetles, carrion, eggs and fungi are also eaten. In autumn, berries are a staple part of the diet. Martens mostly hunt on the ground, although they are superb climbers and extremely agile. Dark brown fur with a yellow/white throat patch and a long fluffy tail. Tail length: males 26-27cm; females 18-24cm. Martens have territories that vary in size according to habitat and food availability. For males these are about 10-25 square kilometres and for females about 5-15 square kilometres. Martens mark their territories with faeces (known as scats) deposited in places where they are conspicuous to other martens; they are frequently left along forestry trails.